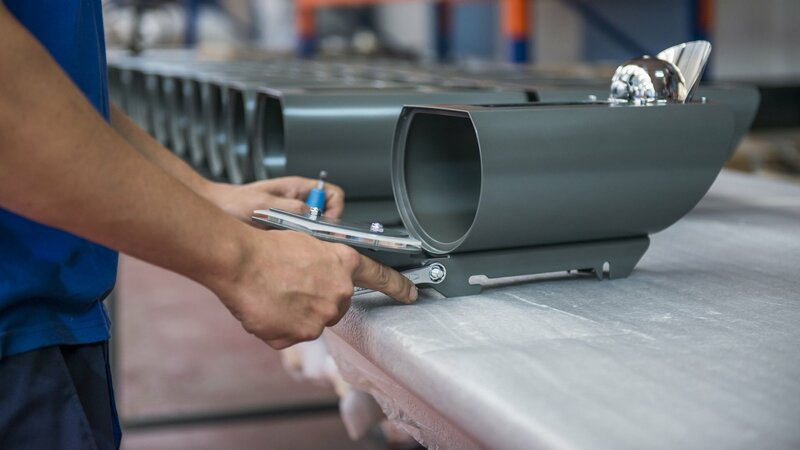 Today, VETA is in position to provide tailor-made sheet metal assembly services giving our customers the opportunity to outsource some of their assembly work, allowing them to focus on their core business. For optimum performance, our advanced assembly facility is organized in four separate areas, e.g storage, assembling, quality inspection and packing. At VETA, we have a strong focus on the material factor. Material knowledge is a fundamental element to product design and engineering as well as a significant advantage when testing new solutions. Each individual material has its own distinctive properties and specifications. A long-life cycle and high product quality can only be achieved when certain standards are met whether the component products are made from sheet metal, tube, wood, plastics or other. Electrical assemblies demand precision, performance and quality control. Project management and the assembly group team leaders, set up an operations workflow which along with a series of quality checks in the assembly line, safeguard the outcome. PEM inserts are used in manufacturing for precision constructions. They can be simply installed using appropriate installation tools and dies matching each thread. Helicoils are widely used in aluminum constructions that incorporate threads for higher resistance to torque and in order to increase the service life of the thread after continuous use. Welded threads may provide solutions to complex fitting problems without leaving traces on the rear surface of the sheet. A series of applications can be accommodated thanks to the wide variety in thread dimensions and materials. Step 1: Punching according to insert dimensions. Step 2: Locating the insert in the press. Step 3: Pressing the insert on the sheet’s surface. VETA offers a full range of printing processes including digital and silk-screen printing. The ability to carry out these activities in-house ensures that our customers achieve cost-effective solutions. With its streamlined and efficient printing methods VETA has managed over the years to reduce product development time and increase the ability to adapt to customers’ needs. Our flatbed printing machine can deal with a wide range of materials. Retail today, has a necessity of combined materials in cases. VETA through its supply chain, may serve in cases, where the project needs not only metal but wood as well. VETA offers customized and diverse types of packaging services. We specialize in bespoke solutions which are product oriented. A series of peripheral packaging machines have been acquired in order to fully protect what is valuable. Your product. Packaging raw materials are administered internally in order to control that no outside factor inconvenience might occur, which shall cause fallbacks on the supply chain.